Both views of the front page. 2.1.1 End of the World? At the Nine Inch Nails concert in Lisbon, Portugal on February 12, 2007. a plain-looking USB flash drive was found in a bathroom stall. It was found to hold a single MP3 file with the title "My Violent Heart." In the ID3 tags of that file, a URL, http://anotherversionofthetruth.com, was found. It can also be noted that on the "Another Version Of The Truth" page of the Year Zero liner notes, the figures "HTTP://" can be made out through the over-typed effect of the text in the booklet, hinting at the website. On first glance, the website appears to be nothing more than a large graphic, with a simple, patriotic, (if somewhat propagandistic) American message, not unlike the kind frequently used by politicians, and it is labeled at the bottom as coming from the US Bureau of Morality. 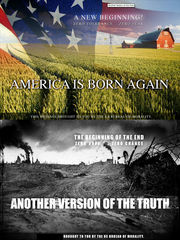 Clicking and dragging over the image begins to reveal "another version" of the graphic, with the cheerful image replaced by a dark and bleak revision of the farm scene, and the text replaced with pessimistic and satirical messages. Once the new image is revealed, clicking the large bold words "Another Version of the Truth" takes you to a message board in which citizens of this particular setting are discussing many things about society, mostly involving resistance to the oppressive authority in place. The discussion in this forum centers around The Presence and what it may be, if it in fact exists. It also contains, in a post, song lyrics: "Used to be the leader/ now comes the time to serve/ maybe we show some mercy/ maybe you get what you deserve." The lyrics are from the Year Zero song Meet Your Master. This forum mainly discusses an act of terrorism at a baseball game that is alluded to by a poster named BeTheHammer. It is assumed that this poster is the same as the author of the Be the Hammer website, which he links to. This forum only has two posts, but does link to an MP3, nohurry.mp3, in which a media report is contrasted with a cell phone recording of what is revealed to be a police murder. This forum centers around the debate which started in the "Acts of Resistance" forum over whether violence is useful in resisting the authority. It also contains a linked MP3, ballgameOver.mp3, in which an assassin, most likely BeTheHammer, talks about organizing the attack as it happens. This forum begins with a link to another MP3, opalo.mp3, which contrasts a media report about the Colombian drug trade and a firsthand account from a Colombian woman, indicating that cocaine's downfall is due to global warming and opal. It should be noted that the woman speaking in Spanish does not have a Colombian accent, but it is an accent originated on or influenced by Mexican or Central American accents. This confusion is commonly observed in American films. It has not been clarified if this contradiction is intentional and meaningful or if it would be, otherwise, only due to a mistake during production. This forum has only one post, a notice to other forum members that the poster's brother was killed and the circumstances surrounding it. This forum lists the names of people who have gone missing, and one post from "Shatter36" indicating he or she is fine; the implication being he or she is one of the people named as missing above. The last entry on any of the forums is 2/10/00 at 14:26, however, there appears to be evidence that dates were changed. Evidence of date mismatch in AVT forum topic page. Click image for close-up. The "glitched" date of the Violent Resistance topic, below the topics on the background image of the topics page, appears different than the text written one. The background shows "Started by AVT001 on 02/04/0000" rather than "Started by AVT001 on 02/10/0000". This same glitch occurs within the discussion threads. Also, the '0's each of the dates' 10s is one pixel wider than other zeros in this same font. Both details suggest that the original dates of these posts may have been altered. It is not yet known the significance of this alteration, however. The Art Is Resistance website has a link to an archived thread, entitled "Artist Behind AIR Goes Missing". The thread mainly discusses the usefulness of art (as opposed to violence) as a tool for resistance. In this thread one of the posters is named BanksyForDictator, which is a note-worthy allusion to the underground icon amongst stencil & graffiti artists worldwide. Art is an invaluable tool of the counter culture, & though many of his masterpieces are fun and light-hearted Banksy is a real world example of art's amazing power to transfer ideas and messages to those who would otherwise remain unaware. For more information on Banksy see www.banksy.co.uk. Another important point made is by Philomela: "It makes it easy for you to think that the cops and the bankers and the soldiers are all Them. They aren’t. They’re us, too." The meaning behind this quote shows that despite a corporations & institutions being symbols of the enemy, the individuals within are not all necessarily enemies, but some maybe victims of circumstance. This page was found through the Survivalism lyrics pdf posted on Yearzero.nin.com. Initially,it shows a page with a dated history of how America created a "new world order" in Year Zero. Similar to the splash screen of the AVT website, this is a propagandistic version, and there is hidden text which shows a contrasting, dissident view. Clicking and dragging the left section of the page to the right, and the top section downward, until the two line up, one can reveal the alternate text. (It is also possible to open the flash file called road.swf. This new text shows how past, current and predicted future events lead to the world described in Year Zero. Found as a link in the Mailstrom Wreckage "Pain", a series of 0 pages have been discovered, each with a clue leading to the next. (Page 1) Step 1: take a new gelled hydrogen power cell and swap it out for the old one in my machine. The point here is— --well, I’ll get to that in time. (Page 5) Step 2: puncture the oxygen line into the power cell and cover the hole with a piece of masking tape. (Page 10) Step 3: Affix a model rocket igniter and 10 second fuse to the masking tape. They have ‘em at any decent hobby store. (Page 15) … Say you wired the ~ key. When it’s hit, it will burn to the igniter which will eat through the tape and ignite the gelled hydrogen inside. If someone is reading a very very small font, their face is likely to be closer to the monitor when it blows up. You lived to betray. Tonight you die for it. There has been 1 image found that was not linked in the HTML. This page was last modified on 3 December 2009, at 09:40. This page has been accessed 187,948 times.